Are you in desperate need of a home office, but are worried that you may not have enough room to make this dream a reality? The professionals at Kitchen and Decor Center have the necessary expertise in home office design. We are here to ease your mind and let you know that in no time you will be sitting at your desk enjoying working from the comfort of your home. Our home remodeling Miami is the best! Whether you are working from home on your latest assignment, getting started on that novel you always told yourself you would write, or just paying some bills, having a dedicated workspace is really nice. If your home is a bit on the small side, this may seem like an impossible dream, but the good news is that there are plenty of ways to squeeze in a dedicated workspace, even in a really small space. You can count on our home remodeling Miami. There is hope for your home. Here are some of the best ideas we have seen to get your office up and running in no time! A cozy nook like this needs only the essentials. This built-in desk has one large drawer for files and smaller drawers for office supplies. Semi-custom cabinetry options are an affordable way to get exactly what you want. Consult your local cabinetry store or home center to explore design options. Or measure your nook and hunt down a ready-made desk that will fit your space. Move your sofa to the center of your living room or family and use the space behind it as a home office. An elegant glass-top desk and narrow credenza occupy the space behind the sofa. With this arrangement, if your TV is centered in front of your sofa, your office will be too, providing entertainment while you work. A wall of solid shelves can sometimes dominate a room, so change it up a bit by adding a desk between shelving units, or in this case, between a bookcase and armoire. To unify the elements and achieve the look of a built-in, keep everything the same color. A quiet attic can provide the perfect opportunity to put an underutilized space to work. A long desk along one of the walls offers plenty of workspace for two people and is simply a tabletop mounted to a series of cabinets. The window in front of the desk provides natural light, while adjustable wall-mount lamps offer task lighting. 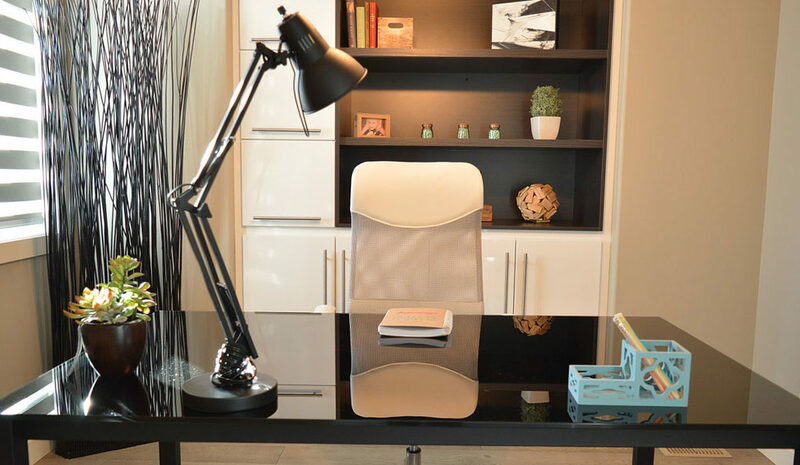 Keep a small office from feeling cramped by using versatile furniture. This collapsible table takes up little visual space and can be rearranged and easily moved. A wall-mount shelf creates an artful wall display. Pull up a comfy chair from the living room to create an instant office space. When it comes to home office design, we are the best choice. Trust our expert kitchen remodelers. Kitchen and Decor Center is a family owned and operated a company that truly understands the importance of the “Family First” philosophy, and it has been the key to our growing success. It is this philosophy that allows for seamless cooperation at all levels of our growing organization, from management to staff and all the way up to our customers. And although you may only work with one or two individuals, rest assured that our entire team is behind you. We believe that the family continues to grow with every new customer. Call us today for more information. We take pride in being the best service for home remodeling Miami. We honestly do offer the best bathroom vanities near me.